Home Tags Posts tagged with "travel gear"
All hail sweater weather! Nothing’s better than inhaling the crisp autumn air, suffused with smoke from a neighbor’s crackling fire. Before the flames dwindle, immerse yourself in fall’s Technicolor displays by taking a trip to a foliage hot spot. These destinations are bucket list worthy year-round but achieve another level of beauty in the fall. Golden hour takes on a whole new meaning in Europe, where winding waterways reflect bronze leaves and gold-plated cathedral spires. Use the season as an excuse to get away and take advantage of discounted fares—the arrival of autumn means the departure of peak-season prices. Take advantage of Brexit and the weaker British Pound and pop over the pond to the lively English metropolis. London is especially endearing in the months leading up to the holiday season. Decorations begin to appear, often in the form of garlands and lights strung across quaint alleyways. Charming is an understatement! Plus London boasts brilliant city planning—everything is walkable and there’s an abundance of green space. The best time to see the green become yellow is from the middle of October through November. Scope out gems like Hyde Park and Kew Gardens by spending the day outdoors in the fiery fall foliage. London’s royal parks are consistently are a favorite for autumn strolls, as the lakeside pathways are ablaze with color. Bring music so that you can have a proper picnic, with The Beatles’ Abbey Road on Lyrix portable, waterproof speakers. As the seasons’ change, the weather can be a bit unpredictable. 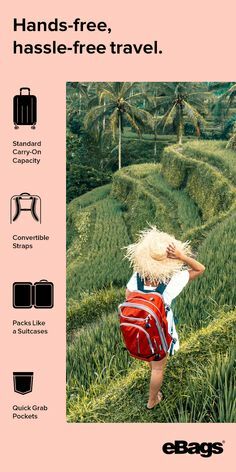 Osprey travel backpacks are brilliant rain or shine, as they’re compatible with the Osprey Ultralight Raincover that packs into its own pocket when not in use. 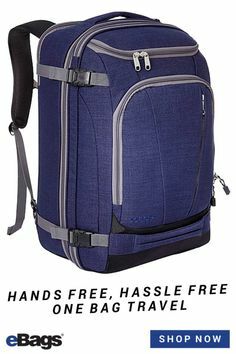 For a quick trip, we love the Osprey Farpoint Travel Laptop Backpack, whose sleek design enables carry-on compliance worldwide. Budapest is the crown of Eastern Europe, bursting with cultural flavor on both sides on the Danube. Grandiose tree-lined streets turn from green to gold, shedding a romantic glow on the city’s ubiquitous sidewalk cafes. Breathtaking fall foliage will be at its finest the last two weeks of October, coinciding with several local celebrations. There are a plethora of autumn festivals in Budapest, ranging from horse racing, wine, and art to celebrations honoring sausages and “chimney cakes,” a traditional Hungarian pastry. The city’s dozens of thermal baths feel incredible when the weather is chilly, and as winter approaches the Christmas markets begin to appear. Sip warm cider as you stroll through the crooked streets lined with orange-leaved trees. 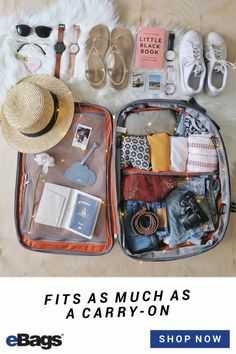 While there will be a fraction of the tourist traffic in fall compared to summer, you should still prepare for large crowds at the markets and places of interest. 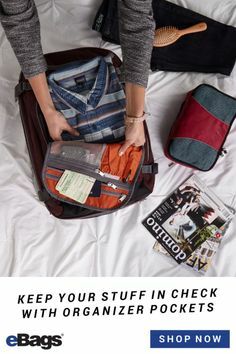 Prevent thieves from virtually stealing your sensitive information as they brush past you by storing your cards in this Travelon RFID wallet and passport case. When abroad, it’s always better to be safe rather than sorry, and this travel set will cover all of your bases. Make your way to the Parliament Building, where you can photograph one of Budapest’s best views: the Danube backed by breathtaking architecture and patches of fiery fall foliage. Hungary tends to be warm, but the banks of the river can feel frigid when the wind sweeps over the water. Wear clothing that can keep you warm or cool, like a chic scarf—the quintessential European accessory! We love this Keds Square Scarf in any weather. The land of lederhosen has more to offer than pretzels and beer; it’s famous for its verdant acres of enchanted forest. Rent a car and cruise Germany’s “Romantic Road,” winding through the Black Forest where colorful trees pop against snow-capped mountains. This world-famous route spans 224 miles, snaking through the Franconia wine region and meandering through an endless list of charming hamlets. Aim to visit during the last two weeks of October, which is the peak time to view fall foliage. The road is famous for its many curves, which can be confusing to navigate, especially when the signs are all in German. Rental car companies’ GPS systems can be unreliable or unavailable in English, so bring this Go-Tenna system, which easily transforms your smartphone into an off-grid portable navigation system. It works worldwide, reducing travel stress and helping you maximize your time abroad. Of course, if you’re taking the Romantic Road you’ll need matching outfits, like these his and hers Nano Puff Vests—essential layering pieces that will keep you at the perfect temperature. This eccentric northern capital is situated near some of the world’s most stunning landscapes. Oslo is on a glistening bay, surrounded by thick forests full of hiking trails and waterfalls. There must be thousands of trees within the city limits, meaning the city’s feeling completely changes when the leaves turn color. Once the sun sets, you’ll be treated to a colorful show if you just remember to look up! Fall is the perfect time to visit Norway, as the Northern Lights are visible again after their summer hiatus. We suggest going at the end of September to see the best fall foliage before it gets too chilly. Exploring a new country is even better when you have an epic soundtrack. Create a wanderlust-inspired playlist and blast it through these PB Travel Sleepphones. The earbuds are nested in a fleece headband to keep your ears toasty and the headphones secure. Want to look like a local—and simplify packing? Wear lots of black. We’re obsessed with this black-on-black Fjallraven Kanken No. 2, and it receives bonus points for being a Scandinavian brand. European fall foliage tends to be yellow and gold, but stateside we experience deep hues of red and orange, according to a 2009 study. I love how the sea of red matches farmhouses dotting the hills, ringing in the American holiday season as Jack-O-Lanterns and squash appear on front porches. New England is the first place that comes to mind when someone mentions fall foliage. And the crème de la crème of New England leaf displays is in Vermont—after all, 80% of the state is covered by forest. Take the 11-mile route from Waterbury, home of Ben & Jerry’s ice cream, all the way to Stowe. This popular ski town offers access to miles of hiking trails and open space, making it the perfect spot for a picnic. 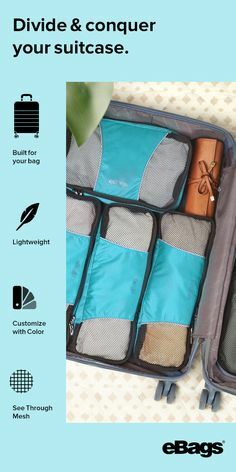 Pack satisfying snacks, sandwiches, and refreshments in the eBags Crew Cooler II, an all-time favorite. The best time to see fall foliage in Northern Vermont begins the second week of September and peaks the first week of October. Get your camera ready for groves of saturated beech, maple, and birch trees; the Case Logic Camera Sling is a leaf-peeper’s ultimate wingman. Boston is irresistible in the fall, as the trees turn colors against some of America’s finest architecture. Boston is known as the “Walking City,” so take a stroll along the Charles Rivers or through the Boston Commons, the oldest city park in the U.S.Lead your own walking tour through Boston’s fall foliage, wandering the Freedom Trail or exploring Beacon Hill. The first two weeks of October are the prime time to experience colorful leaf displays, but if you’re unavailable those weeks just check out New England’s peak fall foliage map to determine another week to visit. 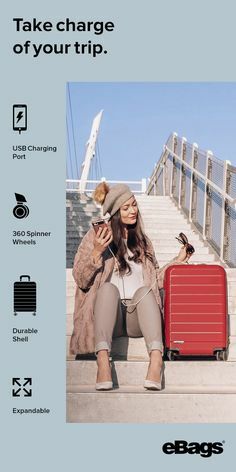 Boston is a fashion-forward metropolis, so look chic when you roll up to your hotel with the eBags Hardside Spinner, a wonderful mix of style and durability. The small size and maneuverability make it perfect for cosmopolitan travel, but its construction is tough enough to take whatever the baggage handlers can dish out. Planning on shopping in between foliage hot spots? The spinner is quite spacious, so your only worry would be exceeding the airplane’s weight limit. To prevent unnecessary fees, weigh your bag before heading to the airport using the eBags digital luggage scale. Breathtaking fall foliage isn’t exclusive to the East Coast. Colorado’s displays of color belong on the pages of National Geographic magazine, as the Aspen forests pop against the snow-capped Rocky Mountains. For an iconic view, head to Maroon Bells, the most photographed peaks in all of North America. The best weeks to see Aspen’s fall foliage are typically the third of fourth week of September. In addition to boasting incredible, fiery forests, Aspen is renowned for its outdoor activities, from fly-fishing and golfing in the summer to world-class skiing in the winter. Regardless of the season, Aspen has miles and miles of hiking trails for every age and ability. American Lake, Hunter Creek, Cathedral Lake and Crater Lake are all fantastic for immersing yourself in fall foliage. Log your miles hiked with this Mio FUSE Fitness Tracker, which monitors your heart rate in addition to tracking your performance. If you prefer to explore on a bike, make sure you stay hydrated in the alpine climate by bringing a backpack that lets you sip while you pedal. 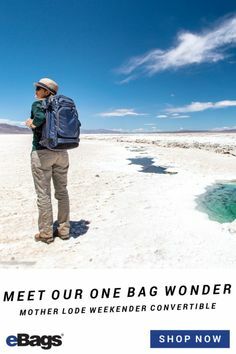 We love the High Sierra Hydration Pack because it holds two liters and its insulated water tube prevents the water from freezing when the temperature drops. Time is of the essence, as Christmas will be here before you know it! Immerse yourself in fall’s wonder and celebrate change. 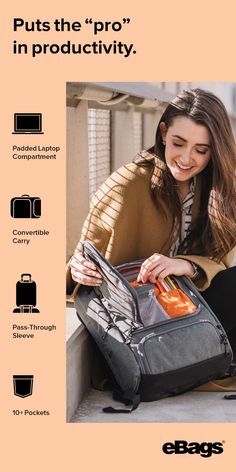 eBags will ensure you have everything for an incredible trip!